I look at my calendar and count the days. Yep, one week and 14 hours since I first opened the door to my new apartment. Sitting here, I glance out the window and scan the expanse of the Yaquina Bay, squinting slightly at the brilliance of the sunlight dancing off of the water’s still surface. With a deep sigh, I reflect:It was only last Tuesday, when my shaking fingers grasped the cold metal of the doorknob and jammed my key into the slot, violently and nervously shifting the rifts into place. I admit–I was purposefully clumsy: with a ball of nerves rocking in my stomach, I was anxious to open that door. Granted, I’ve always dreamt of moving to the West coast, and immersing myself in some sort of ecological adventure. For three years, I painstakingly filled out job applications, eager and willing to chase jays through redwoods, wade through marshes to photograph panthers, live on a boat for months on end with sunsets for a salary, and yet to no avail. Back in December, when I was just ready to throw in the towel, the call to come out to Oregon came to me like a message from the heavens. For two months, I mentally prepared myself, unloaded my closets of excess baggage, and said my goodbyes. Now that I was finally in Newport, I could not bring myself to open that door, and take the first step into the darkness of my new life. Newport is a beautiful place, a fisherman’s village accustomed to the comings and goings of strangers from faraway lands. In my afternoons off, I grab my bike and cruise the banks–which takes you absolutely anywhere and everywhere you want and need to go. Southeast of me is the Oregon Coast Aquarium, decorated by a carnivalesque square of gift shops and general stores, littered with collapsing auto shops. In the winter months it looks like a ghost town. In fact, if you listen closely, I swear you can hear echos of laughter from tourists past. Creeped out much? Cycle Southwest and trip right into the jetties of South Beach State Park, three armored lines of defense sparing Hatfield from the might of the Pacific. Once the sand overcomes the pathway, it’s advisable to abandon the bike and tackle the dunes. A fifteen minute fight with the shifting sand and sporadic rocks is well worth it. Suddenly, you come up around the hill top and, like changing the channel from Bravo to Nat Geo, the scenery flips a switch on you: before your eyes lies miles of white sand beach, flattened by the constant abuse of the cold waves. The horizon melds with the fog of the sky, which creeps onto the shore with the stealth of a mountain lion narrowing in on its prey. Daunting and beautiful, you cannot help but stop, and stare. Craving some social antics? Follow the northern star across the Newport bridge and in no time you’ll find yourself with an array of restaurants, bars, and beachfront views to choose from, depending on your mood, of course. Just be ready to meet a sailor or two, they’re everywhere here, and they’re always ready for an open ear to tell a tall tale. Just west of the town is more beach, prime “habitat” for restless locals and adventurous tourists to set up bonfires in the evenings and for seals to soak up the sun during the day. East is the way out to the local university, Oregon State, the route from which vagrant Easterners, like myself, wander Westwards in their quest for adventure and experience. 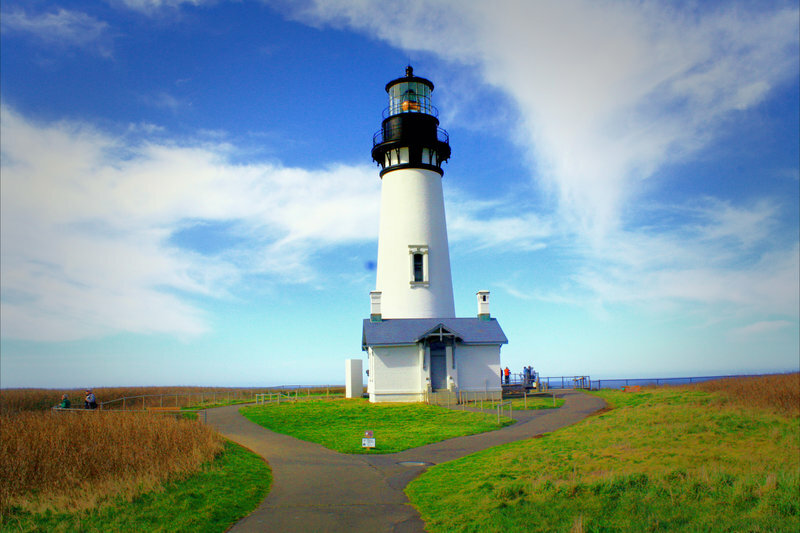 Which brings me to Yaquina Head, one of my several “offices.” The first time I arduously cycled up the road towards the visitor center, I sacrificed my momentum for a glance off of the cliffs and nearly collapsed from astonishment. The mountains, the waves, the trees jetting out from the rocks, barely hanging on for their dear lives, the sun perched in the horizon–it was all too much for just two eyes to handle. There is no attempt at writing, photographing, or painting that could capture even an ounce of the beauty of Yaquina Head Outstanding Natural Area: nature defiantly proves, in this one escarpment of land, that we humans are no match for her artistic prowess. Kudos, nature. 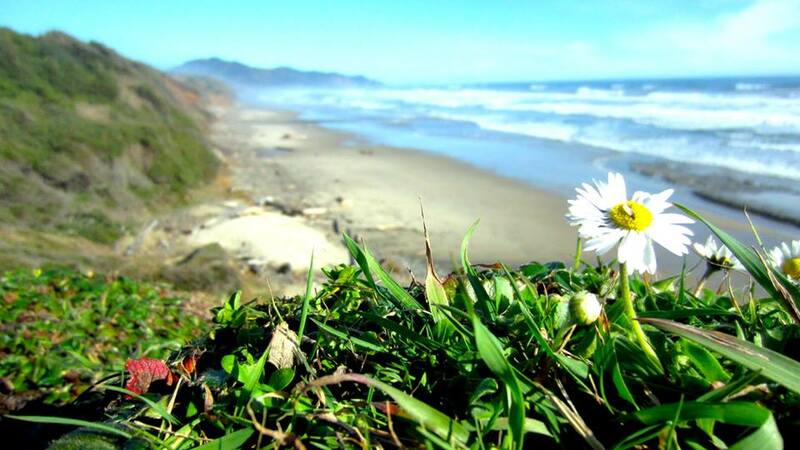 Sunshine is a rarity on the Oregon coast, and this daisy is determined to capture every single ray of it.